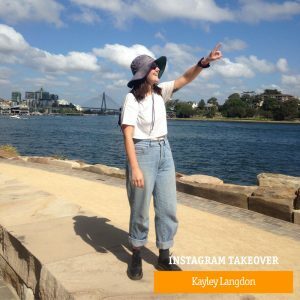 We have launched our Sydney Road Ambassador program where our Instagram gets taken over for a week. Our very first Ambassador Kayley Langdon hails from Canada and has been a Brunswick local for 2 years. The music scene is a big reason for Kayley living in Brunswick. You might find her biking around Brunswick visiting her favourite fruit shop, friends and bars. Or swimming at the Brunswick Baths (She loves the pool!). Kayley studies Communication & Marketing in the city, volunteers for Triple R and works for a local trader newsletter in Hawthorn. You can also find her occasionally out on a farm in Wallan. What is your relationship with Sydney Road, Brunswick? When I first moved to Melbourne I would go to the Brunswick library every day – because I had no money, I had no job yet and I was super new to the country. I spent a lot a time on Sydney Road. Last thing you bought from Sydney Road? I bought a cake at Green Refectory yesterday. My friend is a baker at Green so I always get their cakes. What do you like about Sydney Road and the people? I like how there is young people here and that there is a massive scene of artists. I also love that no matter what time of day it is, I could walk down Sydney Road and see someone that I know. That is pretty sweet. I also love Sydney Road because there are so many different options for things, not just cafes and places to go out. Favourite memory of Sydney Road? My favourite memory of Sydney Road is of Greens which is my favourite place. When I moved back from Canada, for 3 months me and my best friend didn’t have a job every single day we went to Greens and just drank coffee all day. So yeah that’s my favourite memory on Sydney Road. I love Record Paradise and Howler to because they have a lot of gigs. I went to the Snug recently that was so yum. And I love the Howler burgers because they are so cheap and good. Where would you take someone who was visiting from out of town? My friend from Canada visited recently and I took them to record paradise, Greens for the big breakfast and the vintage shops! Then we went to TomTom Tuesday at Howler which is a free gig.